This remarkable, world-class set, is also offered individually on our Merkaba storefront. 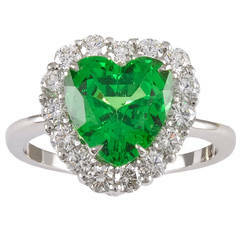 Ring: Rare, extraordinary and vibrant 7.70 carat Chrome Green Tourmaline oval, is set in this ultra fine 6 claw prong setting, and a total of 0.26 carat round brilliant diamonds, to compose this remarkable hand crafted platinum cocktail ring. 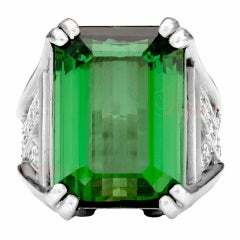 This gem exhibits superior color, cut, and clarity. GIA certificate attached for your convenience. Size 6. Resizing is complementary upon request. Earrings: Rare vivid green pair of cushion Tsavorite Garnets weighing a total of 3.26 carats, are set in these remarkable 1.31 carat total diamond drop earrings. Crafted by extremely skilled hands in the USA. Approximately 0.80 inches in length. ***Returns are accepted within 7 days of delivery and will gladly be paid by us. Rings resized upon request, may also be returned. 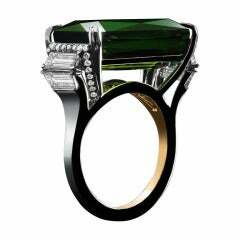 5 green tourmaline stone ring with diamonds and tsavorite in white 18K gold.